BigBird Ventilators feature a nylon fiberglass reinforced bearing housing. This provides superior strength and effortless working action. Solid 12mm aluminium shaft supports the rotor head. Incorporating wind powered exhaust fan. 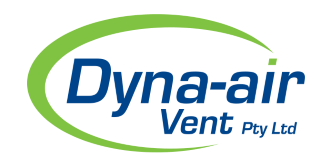 The eave vent will facilitate the removal of hot and moist air from attic space.